Every community needs its storytellers, people who chronicle its history, celebrate its culture, and capture its beauty. Photographer Boomer Jerritt has been fulfilling this role for the Comox Valley for 22 years. His images of the Valley’s people, its landscape, its places and its wildlife have filled local, provincial and national publications, formed the basis of his book, The Comox Valley (with writer Paula Wild), and helped promote our businesses, culture and tourism all over the world. And not just the Valley—as a photographer, Jerritt has, in his own words, “explored every nook and cranny of BC” with his camera, including places only accessible by skidoo, kayak or skis. With photography, the person behind the camera is the one person guaranteed not to be in the picture. Jerritt, who has told so many stories through his images, rarely gets his own story told. So, as someone who tells stories with words, my curiosity is piqued when my editor suggests that I write about Jerritt. His work has often accompanied my articles, and I have my own somewhat glamorous image of him as both a photographer-adventurer and a successful entrepreneur, climbing mountains one day, sealing deals with big-shot commercial clients the next. Spoiler alert here: by the end of my interview with Jerritt, both these preconceptions have been confirmed. But in the meantime, I’ve also had a glimpse of him as a down-to-earth guy, grateful to have found work he loves to do, attached to his home and family, and easy to talk to. Although Jerritt never seems to struggle for words, he right away makes it clear that images are his true medium. Settling onto Jerritt’s comfy couch, looking out over the panoramic view from his Back Road home, I ask him how he got started as a photographer. He leans back and nods. That could be his personal tagline—Boomer Jerritt is definitely a guy who is going to show you stuff. “I’ve always been very visual,” he says, perhaps redundantly, as he holds up the picture. It shows a pencil drawing of a man, wearing an outdoorsy hat and smoking a pipe, with trees behind him. It is intensely detailed, very realistic, and definitely impressive. “This is what I was doing before photography. I drew. I had no formal training in drawing. I just taught myself by doing it. It was going well for me. I was selling originals to the corporate sector in Toronto. But it took so long to draw these, I’d get bored. It took me nine months to make this one. Nine months!” He shakes his head in dismay. “I decided to try something different.” Photography, with its quicker results and multiple uses, was his choice. He attended the Western Academy of Photography in Victoria, completing their two-year diploma program in commercial photography, and graduating in 1990. Jerritt and Heather, his wife, with their two young kids (now in their 20s), were ready to settle down and wanted to find the right community. Jerritt, who grew up as an “army brat,” moving every few years, had lived in Campbell River for a while as a kid. He knew that the Comox Valley offered everything he and Heather were looking for—ocean, mountains, forests and a tight-knit community. They made the move in 1992. During the family’s early years in the Valley, Jerritt worked in construction, while gradually developing his business as a photographer, shooting on weekends until he was became established enough to move into full time photography. “One of my first jobs was with InFocus Magazine in 1993, when we’d just moved here, and it was just starting up. It’s something I still love doing,” he says, adding that being part of the launch of an independent community publication was exciting, and fun. Jerritt has been the main photographer for InFocus since the first issue almost 22 years ago. “It has allowed me to delve into the community,” he says. “For instance, I got to photograph some of the pioneering families of the region. It’s given me that sense of place that I never had growing up. It’s really neat for someone who never had any roots. Jerritt equates his career development to rings on a tree. The inner rings include InFocus Magazine and getting his name out locally and regionally. The next ring is from when he got his contract with Tourism Vancouver Island as a principal photographer for all their tourism guides. This has taken him all over the Island—often, rather dramatically. For Jerritt, outdoor photography means outdoor adventure. Let’s just say that he’s not usually shooting from the comfort of the parking lot. He’s hiking, mountain-biking, snorkelling, climbing, skiing, bush-whacking, kayaking, and skidooing, all carrying heavy photography equipment. Some of it has been gruelling, and some of it potentially dangerous, but he’s been lucky—the worst thing that’s happened was his notorious fall into an 18-foot-deep pit of liquefied cow manure in a Comox Valley farmers’ field. The tale, which he barely lived to tell, was printed in British Columbia Magazine some years ago. One of his favorite adventures involved a plan to snowmobile the 600-kilometre North Canol Trail in the Yukon in early April. He’d done the same trip one summer on a bicycle, but the early spring trip meant braving minus-35 weather and trailblazing through the snow. “We planned for 10 days on the trail, each of us pulling 700 pounds. First we had a 3,000 km trip by truck with our skidoos in the back. Once we get there, we’re in the middle of nowhere. We have no support. There’s nothing there, and no-one there. Just snow. It means route-finding through the mountains. We gave it a good try but the snow was too deep, past our chests. After 300 km we said, ‘Screw it, let’s break camp and go skiing,” says Jerritt, grinning. Further rings on Jerritt’s career tree came from magazine work—in particular, British Columbia Magazine. “For me, being a regular contributor to BC Magazine is a real treat. I remember reading it as a kid growing up, and being enthralled by the stories and the images. It’s such an iconic, historical, landmark publication.” More magazine work followed, including BC Business, Westworld Magazine, Harrowsmith, and more. 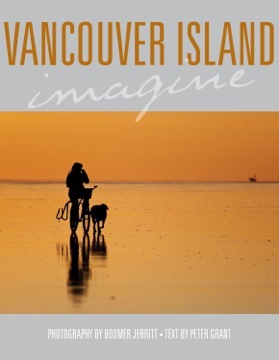 Books were a natural next step: The Comox Valley in 2006, Campbell River, with text by Ian Douglas, in 2010, and most recently, Vancouver Island: Imagine, with text by Peter Grant. As well, Jerritt works with approximately 30 international stock agencies (these companies act as middlemen between photographers and clients seeking photographs, cataloguing a vast database of photos that clients can use for a fee, most of which is passed on to the photographer). A career highlight for Jerritt came in 2010 when the Vancouver Olympic Committee bought one of his stock images to put on 18 giant billboards in the Lower Mainland for three months during the Olympic Games. It was a thrill to see his image (of his daughter playing on a Mayne Island beach), blown up to 20 x 30 feet, welcoming the world to BC. Jerritt’s relationship with stock agencies is one the keys to his flexible lifestyle and his creative freedom. “The stock agencies have the images, and that way they get promoted and distributed all over the world, and I get a cheque every three months. So I can shoot anything. If I get really interested in frogs, I can shoot lots of frogs and give them to the stock agency, and eventually someone will want some frog shots. I have full creative control. Being a freelance photographer doesn’t include job security, benefits, or a company pension package, but Jerritt has absolutely no regrets. On the contrary, he loves the freedom of his lifestyle. “I have total control of my life. That’s one of the highlights—being able to wake up each day and be the one who decides if I’m going to have a good day, or a bad day. Being able to explore my creativity every day. Making my own decisions about what comes next,” says Jerritt, 50. Equally, he loves the contact he has with people, not just through photographing them but also as a teacher. Jerritt has been teaching photography almost as long as he’s been shooting. He taught at North Island College’s Professional Photography program for close to 15 years; he’s taught dozens of courses and workshops for community centres, camera clubs, and other venues, and his photo tours, which take participants to photogenic places like the Great Bear Rainforest and the Broughton Archipelago, are hugely popular. Recently, Jerritt has been expanding his educational program. A couple years ago, he branched out to form a teaching team with well-known Comox Valley photographer Karen McKinnon to offer a range of courses, short and multi-day workshops and residential photography retreats on Hornby Island and in Tofino. McKinnon brings 15 years’ worth of teaching experience locally and at Victoria’s Western Academy of Photography, and of award-winning wedding, portrait and commercial photography. Working together, Jerritt and McKinnon can offer twice as much individual attention, as well as different points of view and personal styles, making their classes extra-dynamic, says Jerritt. As well, Jerritt has developed a series of mini-salons—compact three-hour sessions—each focusing on one topic such as night photography, stock and landscape photography, and working with a flash. Although he loves teaching, Jerritt has no plans to give up his commercial photography. “People ask me if I think about retiring. Well that ain’t gonna happen!” says Jerritt with a grin. He’ll keep telling the stories of the Comox Valley and British Columbia with his images, while helping others learn to do the same.